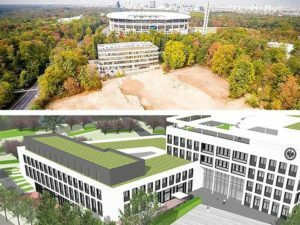 It was during the preparations for 1972 Berlin Olympics, that German architects von Gerkan, Marg and Partners (gmp) got its first brush with stadium building. gmp stood second in the design contest for the mega sporting event. Over the ensuing years, gmp established itself firmly among the world leaders in the field of stadium design with over 20 built stadia, including a number of stadia for FIFA World Cup™ worldwide. For Prof Volkwin Marg, who along with fellow architect Meinhard von Gerkan founded gmp in 1965, the Berlin Olympics design contest remains a key turning point. This is when Marg first started to gain a curiosity and passion for stadium building and how people behave in such an environment. “For us coming second was a great triumph, to be able to join the international architecture scene and to take part in top tier projects. As a young office we achieved a lot of success from other projects too,” said Prof Marg, adding that he had learnt a great deal and found the experience positive and rewarding. “At about the same time we won other competitions, for example the Diekirch Sports Center and the University Sports Forum in Kiel. These are now already historical monuments. We did however win another competition project that enabled us to build the now famous Berlin Tegel Airport,” he said with great pride. gmp first found fame in 1975, with the unique Berlin Tegel Airport’s utilitarian hexagonal shape, showing that there was a new and more efficient way to construct an airport terminal. They then went on to do numerous landmark projects that included the stunning Berlin Central Train Station. 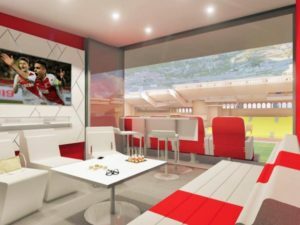 More recently however they have gained global acclaim in the stadium building industry, specifically in relation to their football venues. Prof Marg’s philosophy on stadium design is simple. 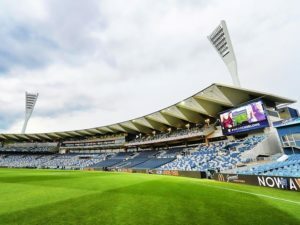 He believes that a clear and unhindered view of the action is paramount and therefore that should be the primary focus when it comes to stadium design. This, coupled with a teeming yet comfortable and clear layout, is what fans and owners alike really want. “I want optimal density and vision for the fans. I have particular demands on the way I want to lead the public – from the different fans to VIP guests. The most important thing in differentiating stadia is the location and the differing identity of their corresponding cities,” he explained. The history of sporting arenas – or stadia as they are known today – and their construction dates back to classical antiquity and makes for a fascinating narrative. Prof Marg has a deep-rooted knowledge and understanding of this and also sees how the role of the stadium changed from one civilisation to another. Prof Marg pointed out that the Ancient Greeks used the arenas primarily for their paramilitary ritual exercises that went on to form the basis for the Olympic Games. The Romans on the other hand, no longer used the stadia for physical competition but also as a spectacle to display the power and stature of the empire as a means to intimidate and control the masses. “The great Roman Emperors opened the games and directed the interests of the Roman public, and later in all provincial capitals, through sport and games in the direction the politicians wanted,” he elaborated. Continuing with the historic narrative, Prof Marg emphasised that stadia are not a modern phenomenon and in many cultures around the world, the gathering place for people to see and to be seen is a fundamental human need. After its involvement with stadia and sports facilities projects around the 1972 Berlin Olympics, curiously the next three decades saw gmp depart from such ventures as the company found themselves engaged in other important projects following the success of Berlin Tegel Airport. However Prof Marg’s passion for stadia design seems to have brought the company back ‘on the grounds’, with gmp architects getting involved in many famous and award winning stadia projects in the last 15 years. 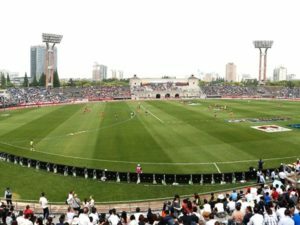 These include the refurbishment of the historic 1936 Berlin Olympic Stadium; the delightfully angular Sports Center in Shenzhen, China; the Warsaw National Stadium of Poland; as well as two 2010 FIFA World Cup stadia in South Africa, to name but a few. In the case of Durban, South Africa for example, it was more than just about creating a well-functioning stadium. The organisers wanted people to know more about the city and for the whole place to be more visible. “The organisers gave us a very clear mission, ‘put us on the map!’,” said Prof Marg. “Durban wanted to gain major sporting events like Commonwealth and Olympic Games from the beginning. One needed a stadium that can do everything and creates a character. The skyline of Durban should be promoted, especially through the stadium, to overcome the history of apartheid and deliver the message that the population in Durban is a colorful mixture with all nations and all skin colors in a compatible community. Someone said: ‘We are a rainbow society. Just think of something for it’,” he said elucidating on the brief. “As a symbol of the multi-cultural society in Durban, we have built a symbolic rainbow arch design for the roof construction. And similar as in Berlin, we have also opened the stadium to the city whereby you can look at the city from the inside of the stadium and vice versa, so the optical connection is made to the city. This is why we have won the competition. The enthusiastic owner wanted even more from us. Today you can drive up that arch with a train and get off it at 104 meters above the stadium and look across the entire city. This stadium has become a successful political symbol for the city,” Prof Marg explained how the vision was translated on the ground. With such recent successes and an almost unrivalled knowledge of stadium design and the building industry, Prof Marg has added immeasurable value to the Coliseum Summits. The company: Over the past 45 years, architects von Gerkan, Marg and Partners (gmp) have designed and constructed over 300 buildings worldwide including many seminal stadium venues. Founded in 1965 the company has steadily grown and now houses 500 employees globally. Everything from small scale homes, hotels, museums, stadia, theatres, office buildings, commercial centres and lots more in their seemingly endless repertoire of distinctive solutions. The architect: Volkwin Marg was born in 1936 in Königsberg, East Prussia and spent his childhood years in Gdansk, Poland. Like many others, Marg had to flee with his family to various parts of Germany during the Second World War. Marg and his family finally moved and settled in the outpost of West Berlin. From 1958 to 1964 he studied in Berlin and in the Braunschweig University of Technology. After graduating he quickly founded what is known today as gmp with fellow architect Meinhard von Gerkan.